Built for the Heroes Guild of LCC, Level: Journeyman(2) "Your hero slaying a monster." Mark of Falworth won a major victory in the Siege of Lost Souls, The Outlaws were thrown from the massive walls and the fierce Dragon was finally forced to flee before the swarms of knights. The casualties were numerous on both sides. And the Castle was soon abandoned by the crusaders as they didn't want to leave a garrison behind in enemy territory. A fortnight later, Mark of Falworth and his companions Vaasco Suariz and Gonsaluus Petri (both valiant knights of the realm) were on a simple reconnaissance mission, when they spotted a huge object in the sky. They quickly realized it must be a Dragon, indeed it was the very one they had faced only a little while ago. It was careening right towards them! Vaasco shouted, "Forsooth, my liege! Let us with due expedience make our way towards yonder thicket that we mayest avoid the fierce Dragon, which would seek to do us grievous ill!" "Nay," replied Mark, "For yonder dragon did accept battle on my terms, so will I accept battle on his terms..."
Gonsaluus interrupted, "But sir, verily even the bravest of knights would not dare to battle a dragon single-handedly, especially considering every knight's life is needed for the cause." “Thou speakest wisely Gonsaluus, but this dragon, surnamed ‘the cunning’ for his shrewdness of brain, can still be defeated by clever stratagem.” Mark winked at his companions, then dismounted from his horse in one fluid motion and marched alone towards the beast. The dragon, with a great flurry of its wings, landed a few yards away and breathed a blast of flame at the knight. Mark jeeringly called out to the monster, "I bid thee good day, fine fellow. But, sink me, I cannot feel the heat of your fire! are thou still out of breath from the beating I gave you two weeks ago?" And inhaled deeply so as to scorch Mark to a crisp! And at that instant, just before the Dragon breathed forth the flame, he hurled his sword straight into the throat of the vile creature! The monster reared back in shock and pain. Then, turning its head to the heavens, let loose a roar which shook the earth for miles around as blood and fire shot towards the sky. "Take no offence, sir dragon, But thine head will make a most worthy present to the King." And so the evil dragon, Mindarus the Cunning, was defeated by the equally cunning Mark of Falworth For the Glory of Loreos! Never disappointing. Another great moc! I love the knights and again that dragon is amazing! 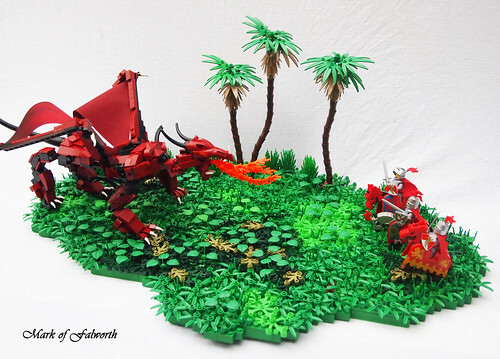 Fantastic MOC! Love the way you did the dragon's wings. I love it Mark! The dragon is amazing! Very nice dragon and the greens as well. Excellent! I love all the textures in the folliage and your trees are great! Really nice story too.